Has your family recently fallen in love with camping? The adventure, the time spent together, and the memories that will last a lifetime make camping a great hobby for many families in the Redlands area. Those who are new to camping or who find themselves taking several trips a year often begin to consider investing in a recreational vehicle (RV) in order to take those outdoor adventures to the next level. While an RV would make certain parts of travel and camping easier, it's not a small decision. In fact, there are several things a potential buyer must consider, such as finding a place to park that RV when you're not using it. In many cases, the RV will be used heavily during the summer months and then parked during the off-season. Whether you simply don't want to use up all your driveway space or your neighborhood home owners' association won't allow it, off-site storage is often a necessary part of RV ownership. Fortunately, there are many self-storage options, including indoor, outdoor, or covered, large spaces or smaller units, and short-term or long-term leases. Vines Storage in Redlands offers all of these options plus a host of amenities that make recreational vehicle storage simple and painless. Our clients can choose between indoor units and outdoor spaces depending on their budget and their needs. While outdoor covered spaces will provide you with a place to park your RV, the indoor spaces provide the benefits of additional safety and more protection from pests. This can prevent expenses for repairing damages in the future. 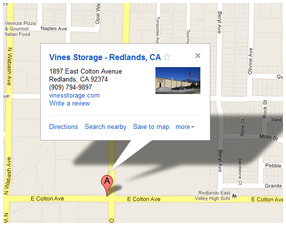 Additionally, Vines Storage is a safe and secure facility. Our gates are locked all day, every day, and only accessible by our clients. We have more than 30 cameras that monitor the facility and a professional and helpful staff that's trained to look for suspicious behavior. We also offer amenities such as a waste dumping station, a high-capacity ice machine, and more, so that our clients can spend more time on the adventures that they love. For more information about long-term or seasonal storage for your RV, call or stop by Vines Storage today.